Maxcem Elite Cement Bangkok, Thailand. 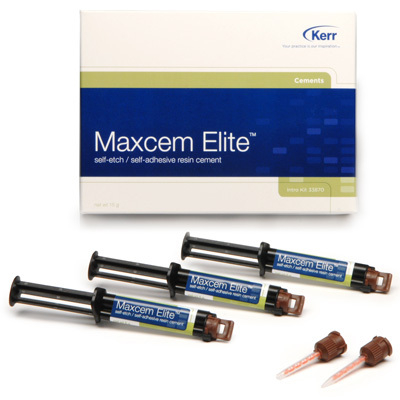 Maxcem Elite™ is simplicity refined, with enhanced bond strengths and superior ease of use. No more 90-second wait before tack curing, no hand mixing and no refrigeration required. For clinicians who want great bond strength and material stability in a single-step resin cement for indirect restorations, Maxcem Elite self-etch, self-adhesive cement offers proven technology without sacrificing performance. Superior color stability enables its use under esthetic restorations anywhere in the mouth, dispensing directly into the restoration or prep. Optional curved tips are available for inlay/onlay and root-canal applications. • Bond strengths between 22-36 MPa. Depending on substrates. High bond strengths without an adhesive. • Ease of use. No need to refrigerate, easy cleanup, and no hand mixing required. • Compatibility with common substrates. Anterior or posterior ceramics, PFMs and metal restorations, and CAD/CAM materials. • Efficient self-cure mechanism. Sets up completely in the absence of light.